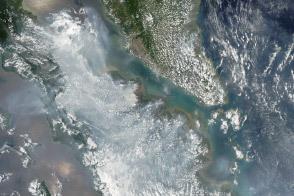 Fires continue to blanket Sumatra with haze. 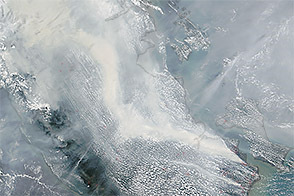 This image, taken on March 7, 2014, by the Moderate Resolution Imaging Spectroradiometer (MODIS) on NASA’s Aqua satellite, shows fires outlined in red. The fires burn in peat forests, which produce dense smoke when they burn. Fire detections from the MODIS sensors on both the Aqua and Terra satellites play a significant role in monitoring burning in Indonesia. 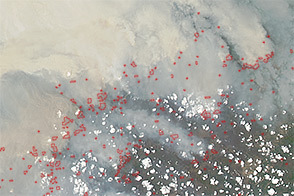 This image shows around 400 fire detections, meaning that MODIS detected at least one fire in about 400 one-kilometer pixels. According to local news reports, some of the more intense fires are burning in the Giam Siak Kecil-Bukit Batu biosphere reserve and were deliberately set to clear land for palm oil plantations. The Giam Siak Kecil-Bukit Batu biosphere reserve contains just over 700,000 hectares of peat forest that sustains a wide range of plant and animal species including the Sumatra tiger, elephant, tapir, and sun bear. It is illegal to set fires to clear land in Indonesia, but the practice is common. The chief of the Indonesian National Disaster Mitigation Agency told ANTARA News that 99 percent of the fires in Sumatra and Kalimantan were deliberately set. Most fires occur during the dry season between April and October. The fires in 2014 started in February and have already forced Indonesia to declare a state of emergency because of poor air quality. The Aqua MODIS sensor detected some 400 fires burning in Sumatra, Indonesia, on March 7, 2014. 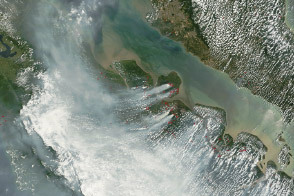 Land use fires burn in Indonesia. ANTARA News (2014, March 7) Racing against time to save Riau’s biosphere reserve from fires. Accessed March 7, 2014. 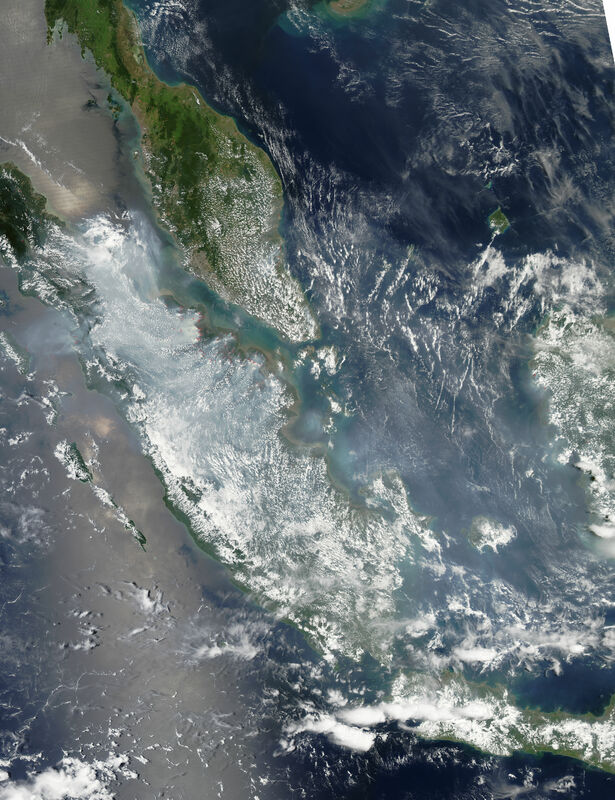 ANTARA News (2014, March 1) Satellite detects 1,046 hotspots from forest fires in Sumatra. Accessed March 7, 2014. UNESCO (2011, July) Giam Kiak Kecil-Bukit Batu. Accessed March 7, 2014. Wall Street Journal (2014, February 27) Fires prompt state of emergency in Indonesia’s Riau. Accessed March 7, 2014.